Download "Introduction. PCI DSS Overview"
3 across open, public network Maintain a Vulnerability Management Program Protect all systems against malware and regularly update anti-virus software or programs Develop and maintain secure systems and applications Implement Strong Access Control Measures Restrict access to cardholder data by business need to know Identify and authenticate access to system components Restrict physical access to cardholder data Regularly Monitor and Test Networks Track and monitor all access to network resources and cardholder data Regularly test security systems and processes Maintain an Information Security Policy Maintain a policy that addresses information security for all personnel PCI DSS 3.0 Requirements Met by Desktop Central Let us see how enterprises can use ManageEngine Desktop Central, the desktop and mobile device management solution, to comply with PCI DSS requirements. 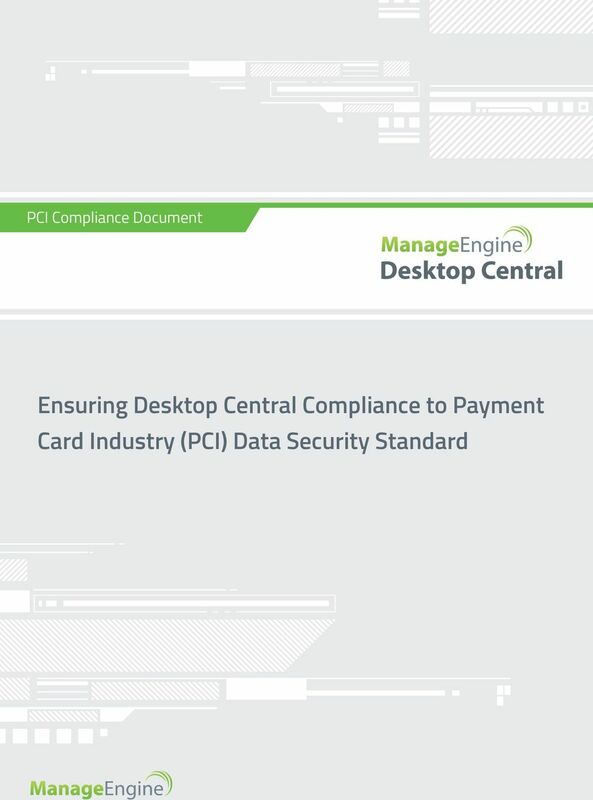 This document will help IT team gain an understanding of ManageEngine s Desktop Central and how it can help to meet PCI DSS requirements. 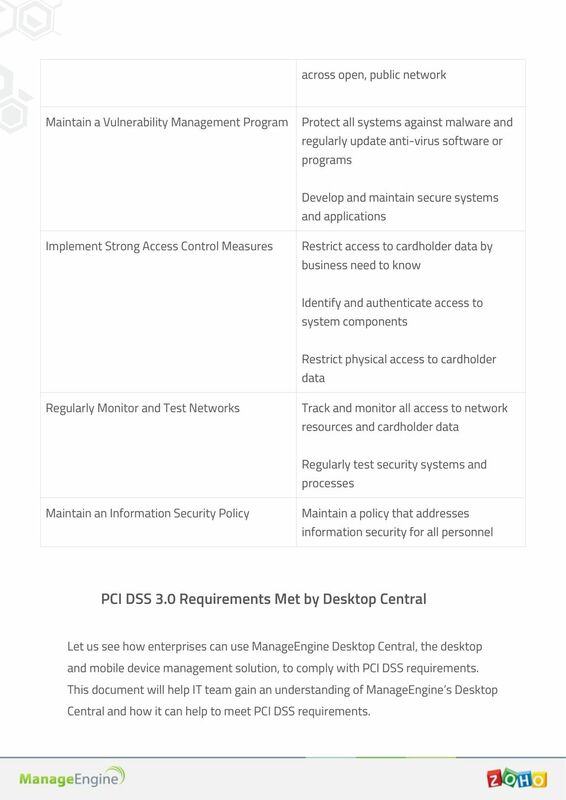 4 The following table outlines the PCI DSS control requirements that are fulfilled by Desktop Central. 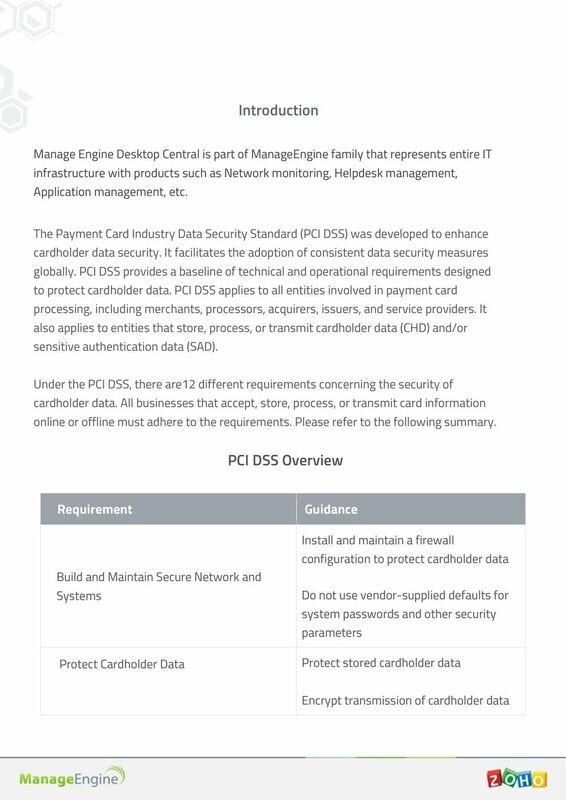 The requirement description listed is taken from the PCI Security Standards Council website. ( Requirement Requirement Description How Desktop Central fulfills the requirement? 1.4 Install personal firewall software on any mobile and/or employee-owned devices that connect to the Internet when outside the network (for example, laptops used by employees), and which are also used to access the network. 2.1 Always change vendorsupplied defaults and remove or disable unnecessary default Desktop Central s software deployment helps IT admin install any kind of.exe or.msi applications, including firewall software. It will allow the IT admin to manage and monitor applications. This feature is supported for both Windows and Mac. For mobile devices, Desktop Central Mobile Device Management provides the ability to install firewall applications and allows IT admins to monitor the status of applications through an inventory console. 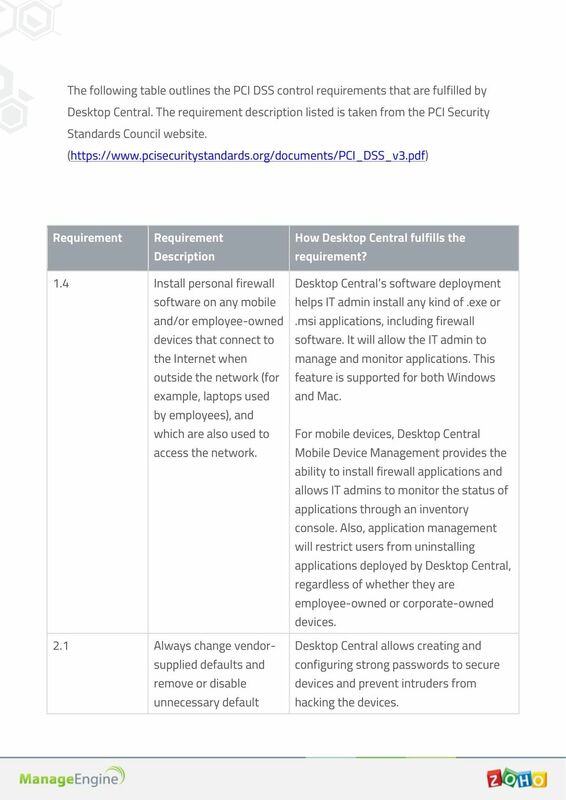 Also, application management will restrict users from uninstalling applications deployed by Desktop Central, regardless of whether they are employee-owned or corporate-owned devices. Desktop Central allows creating and configuring strong passwords to secure devices and prevent intruders from hacking the devices. 6 Perform periodic scans Definitions. Generate audit logs which are retained per PCI DSS Requirement Establish a process to identify security vulnerabilities, using reputable outside sources for security vulnerability information, and assign a risk ranking (for example, as high, medium, or low ) to newly discovered security vulnerabilities. 6.2 Ensure that all system components and software are protected from known vulnerabilities by installing applicable vendor supplied security patches. Install critical security patches within one month of release. Desktop Central periodically scans the systems in the organization's network, identifies missing patches, and installs them based on system risk ranks such as healthy, vulnerable, and highly vulnerable. And, IT admin can use Desktop Central to customize these ranks. As a remediation action, IT admin can deploy patches based on the rank and ensure systems are secured with the latest patches. 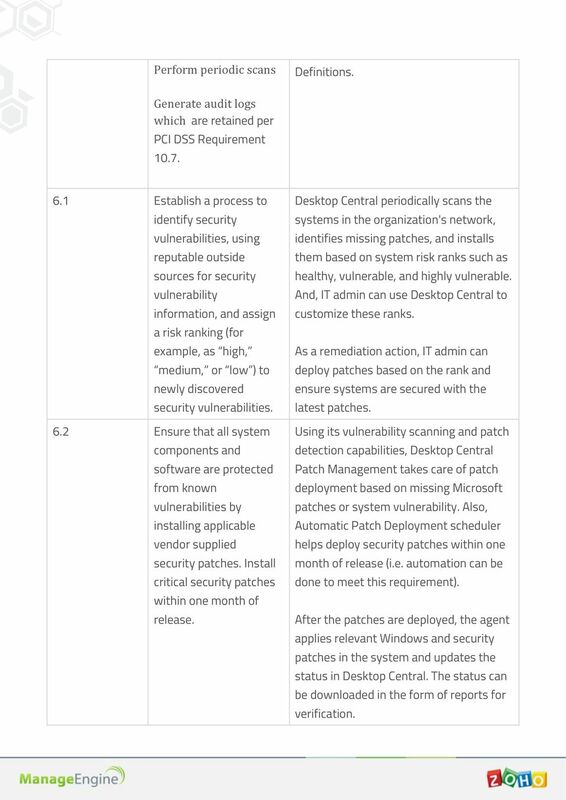 Using its vulnerability scanning and patch detection capabilities, Desktop Central Patch Management takes care of patch deployment based on missing Microsoft patches or system vulnerability. Also, Automatic Patch Deployment scheduler helps deploy security patches within one month of release (i.e. automation can be done to meet this requirement). After the patches are deployed, the agent applies relevant Windows and security patches in the system and updates the status in Desktop Central. The status can be downloaded in the form of reports for verification. 8 the user ID If a session has been idle for more than 15 minutes, require the user to re-authenticate to re-activate the terminal or session. the allowed time, the system gets locked automatically. Desktop Central s power management helps configure systems by enabling an option to prompt for password when the system is on Standby. The user can authenticate when the system resumes. The set configurations can be deployed to multiple systems from a central location, which gives the IT admin complete control. Also, remote session settings allow IT admin to configure maximum idle session time out, i.e. if the session exceeds the idle time, the session is disconnected, and the remote machine is locked automatically Passwords/phrases must meet the following: Require a minimum length of at least seven characters Contain both numeric and alphabetic characters. 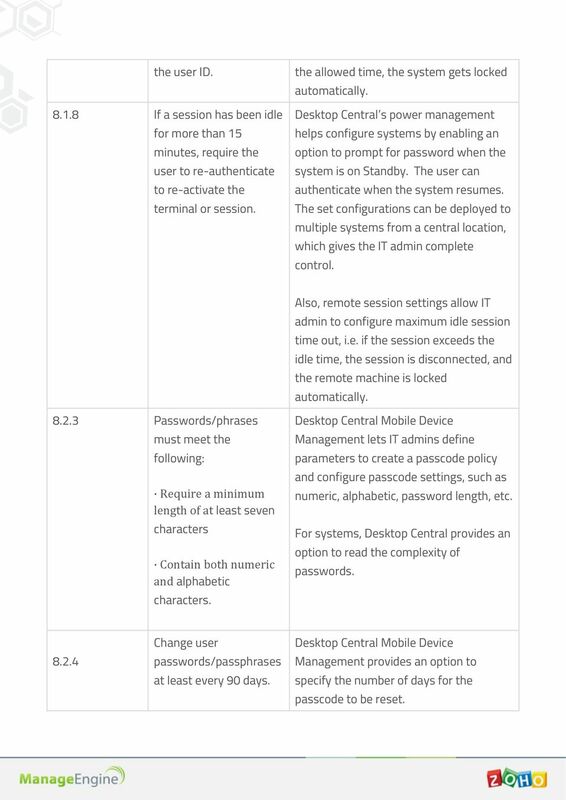 Desktop Central Mobile Device Management lets IT admins define parameters to create a passcode policy and configure passcode settings, such as numeric, alphabetic, password length, etc. For systems, Desktop Central provides an option to read the complexity of passwords Change user passwords/passphrases at least every 90 days. Desktop Central Mobile Device Management provides an option to specify the number of days for the passcode to be reset. 9 For systems, the IT admin can configure alerts at specified dates in Desktop Central to notify the IT team based on which the team can take actions Do not allow an individual to submit a new password /phrase that is the same as any of the last four passwords /phrases he or she has used Properly maintain inventory logs of all media and conduct media inventories at least annually Perform quarterly internal vulnerability scans and rescans as needed, until all high-risk vulnerabilities (As identified in requirement 6.1) are resolved. Scans must be performed by qualified personnel Implement a risk assessment process that: Is performed at least annually and upon Desktop Central Mobile Device Management allows several passcodes to be maintained in the history, which means an IT admin can specify the number of previous passwords to be maintained, so that users do not reuse them. Desktop Central helps maintain hardware device usage logs, including USB device logs. This log information can be downloaded in the form of reports for audits and to find who did what and when. Patch Manager can perform system scanning with Desktop Central; it scans the entire system for missing patches in the operating system. The level of vulnerability is reported with details such as system vulnerability level, missing and applicable patches, task status, etc. 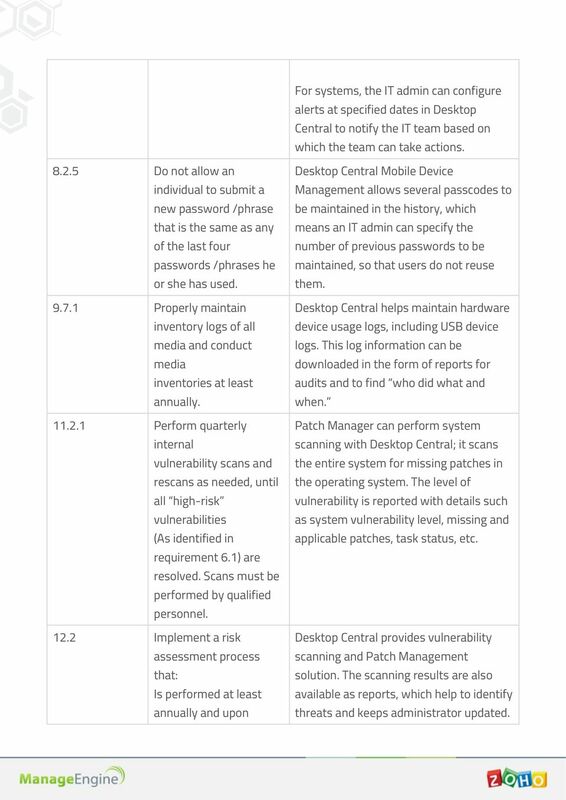 Desktop Central provides vulnerability scanning and Patch Management solution. The scanning results are also available as reports, which help to identify threats and keeps administrator updated. 10 significant changes to the environment. Identifies critical assets, threats, and vulnerabilities, and Results in a formal risk assessment Develop usage policies for critical technologies and define proper use of these technologies. 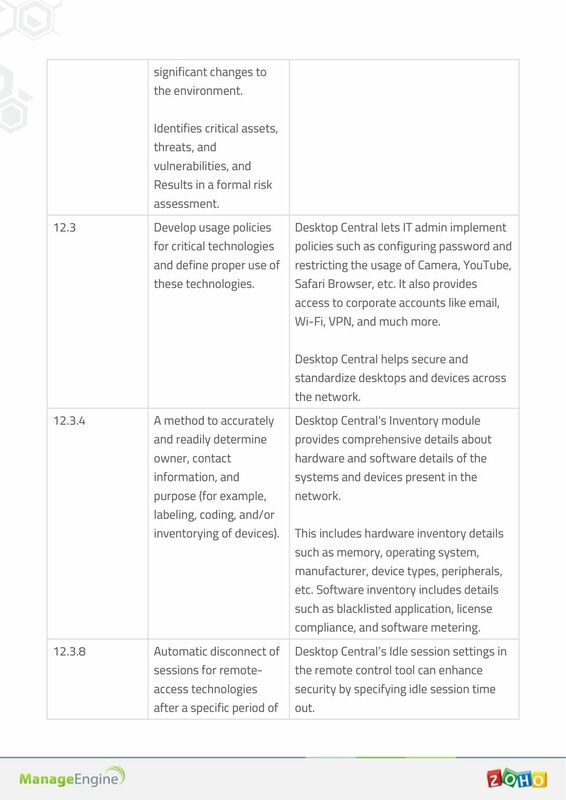 Desktop Central lets IT admin implement policies such as configuring password and restricting the usage of Camera, YouTube, Safari Browser, etc. It also provides access to corporate accounts like , Wi-Fi, VPN, and much more. Desktop Central helps secure and standardize desktops and devices across the network A method to accurately and readily determine owner, contact information, and purpose (for example, labeling, coding, and/or inventorying of devices) Automatic disconnect of sessions for remoteaccess technologies after a specific period of Desktop Central's Inventory module provides comprehensive details about hardware and software details of the systems and devices present in the network. This includes hardware inventory details such as memory, operating system, manufacturer, device types, peripherals, etc. Software inventory includes details such as blacklisted application, license compliance, and software metering. Desktop Central s Idle session settings in the remote control tool can enhance security by specifying idle session time out. 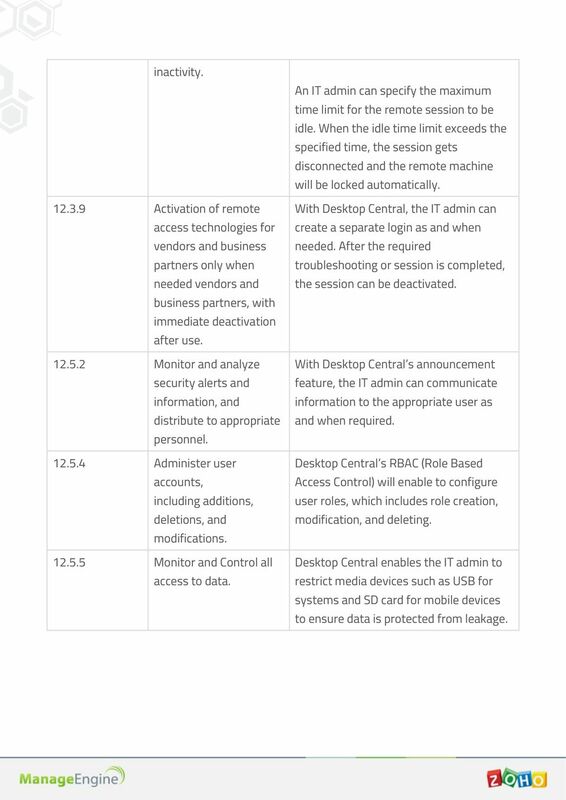 11 inactivity Activation of remote access technologies for vendors and business partners only when needed vendors and business partners, with immediate deactivation after use Monitor and analyze security alerts and information, and distribute to appropriate personnel Administer user accounts, including additions, deletions, and modifications Monitor and Control all access to data. An IT admin can specify the maximum time limit for the remote session to be idle. When the idle time limit exceeds the specified time, the session gets disconnected and the remote machine will be locked automatically. With Desktop Central, the IT admin can create a separate login as and when needed. After the required troubleshooting or session is completed, the session can be deactivated. With Desktop Central s announcement feature, the IT admin can communicate information to the appropriate user as and when required. Desktop Central s RBAC (Role Based Access Control) will enable to configure user roles, which includes role creation, modification, and deleting. Desktop Central enables the IT admin to restrict media devices such as USB for systems and SD card for mobile devices to ensure data is protected from leakage.